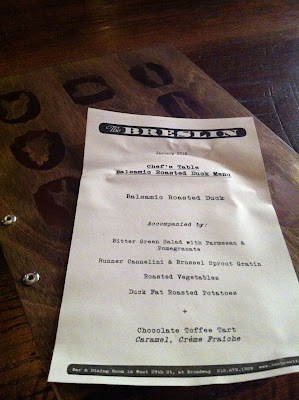 The next night (I really should give myself more pause between gorging dinners), I had been invited to join a group of friends at the Breslin, for their famous whole-animal dinner. This style has become popular in the US of late, which is a nose-to-tail eating of a particularly animal and it is a chance for chefs to showcase their talent on all the bits and pieces, usually of a porcine. Those of us who live in Asia will probably have little sympathy for this kind of cooking, since that sort of esoteric eating is what we do traditionally anyway. There are some parts of animals or birds that are best not eaten, if you can afford it. 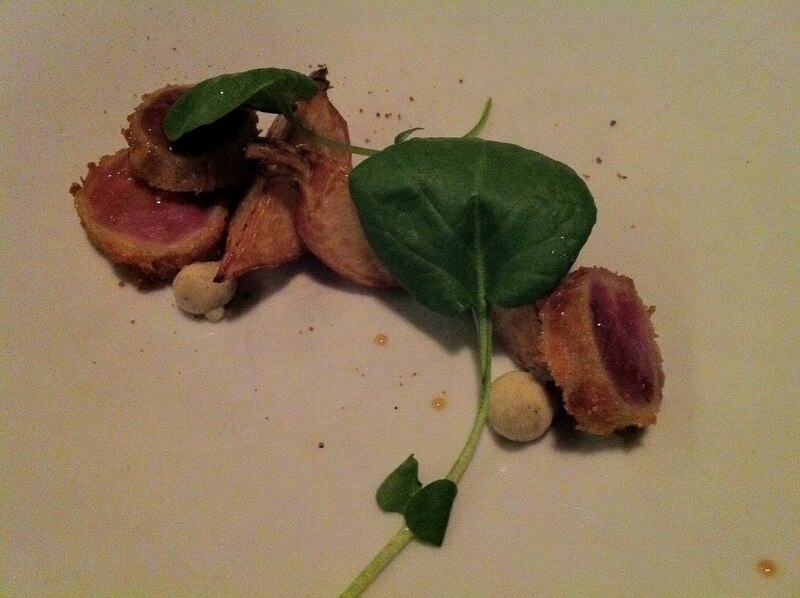 (And I've still yet to see any of the NYC chefs do rabbit head or goose neck). The Breslin is one of April Bloomfield's gastropubs and during this trip, I went to two of them, this and the Spotted Pig. (I had heard much about the Spotted Pig's burgers and shoe string mandolined onion fries but when we got there, it was a ridiculous two hour wait for food in what resembled a noisy sportsbar, while the staff changed shifts and lost our orders). The Breslin by comparison, was a hip restaurant/bar, attached to a hip hotel and the decor was striking, if somewhat too dark to be a restaurant. I was actually somewhat disappointed not to be able to get to taste their signature items like their famous lamb burger and crispy octopus. We were seated at the chef's table, right in front of the kitchen window, so the atmosphere was really great but the food took a long, long time to be cooked. When the bird arrived, I was further disappointed to realize it had not been roasted, like a confit or a sliced duck breast, but it had been done in some combination of braise and roasting, which made it taste, almost exactly, like a Chinese roast duck. Boo. 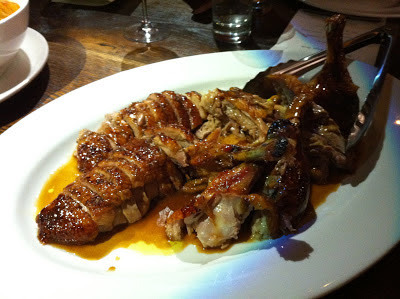 I also thought that 'snout-to-tail' meant that different parts of the duck would be cooked differently, like duck confit, half a roasted duck and half a braised duck, webbed duck feet stew, things like that. But apparently that was not the plan and instead we got many sides for the duck, particularly lots of carbs, roast potato and mac and cheese and beet salad. 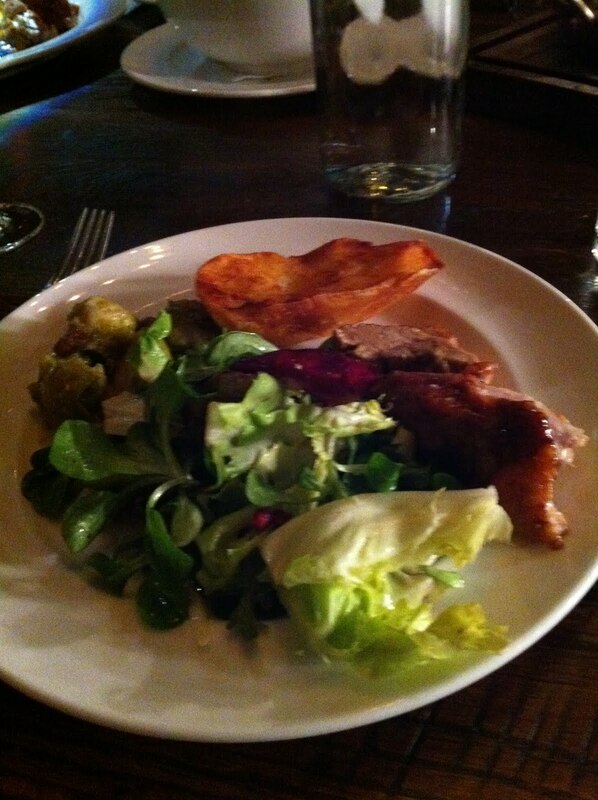 The duck was quite good and so were the sides, but sadly the best thing on the table menu were the potatoes, which I think were sliced in half and then deep fat fried. How crazy is that? I read their reviews and was told they make thrice-fried chips the way Heston Blumenthal does, so I guess they do the same with their potato halves. Those were really good but so filling that I could only choke down one or two. 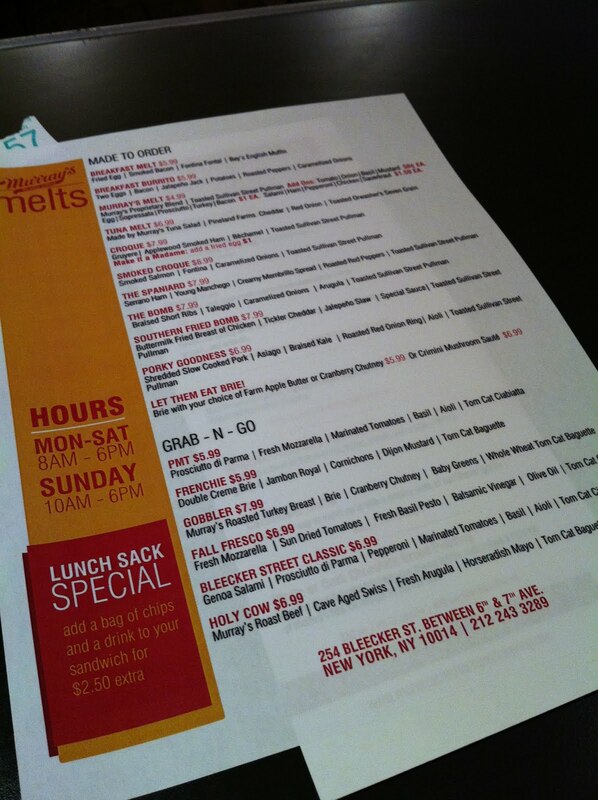 I didn't remember anything of the service, but the 18% gratuity is included. Yes, it is one of those more than slightly pretentious places and no, I won't be going back unless I'm in the neighbourhood and craving a lamb burger. The next day, I took advantage of my location on the Lower East Side and went for a cheese class at Murray's Cheese Shop. Murray's is quite an institution, a cheerful 1940's red and yellow emporium of world-class cheese. 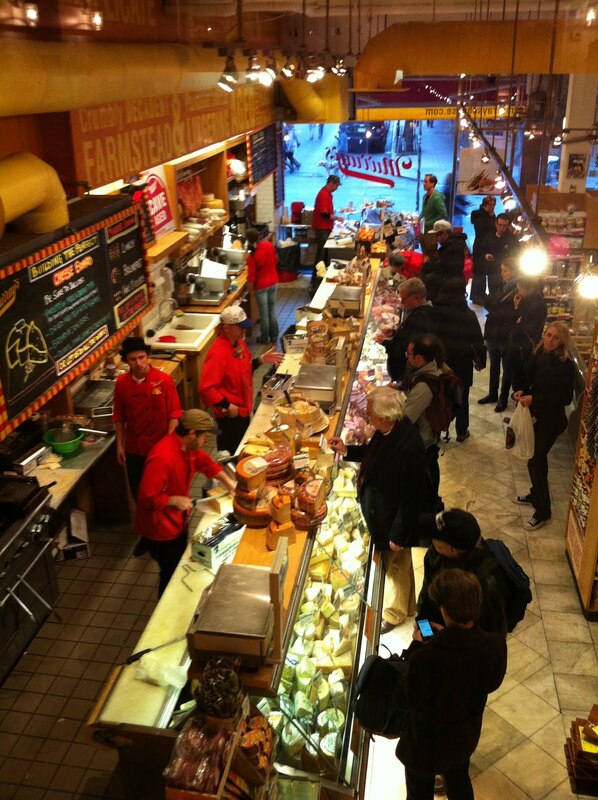 The cheese counter is exceptional and the store is really built around cheese, it's quite a sight to behold. They have cleverly incorporated education and tours as part of their service and they offer a really full suite of cheese classes. They also offer a menu and cheese-related sandwiches during the day, I would definitely drop by for lunch if I lived in NYC. 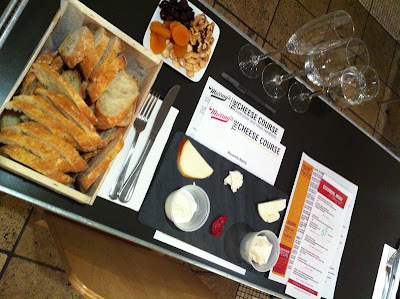 The first part of the class was a sampling and explanation of their soft and hard cheeses with a free flow of bread and wine. Murray's hosts cheese classes on subjects ranging from cheese cave tours to mozzarella making, and even a weekend cheese "boot camp." I saw quite a few couples there on a fun date- what a good reason to live in a big city like New York huh? The Mozzarella Making ($100/class) starts with a tasting of five types of fresh cheeses. Clockwise from the top: Lioni Mozzarella Curd, Lioni Lightly Salted Mozzarella, Mozzarella di Bufala, Burrata, and Lioni Smoked Mozzarella. Our instructor walked us though each step of how to smell, taste, and feel the cheese, explaining the process of making each cheese and how they were different. 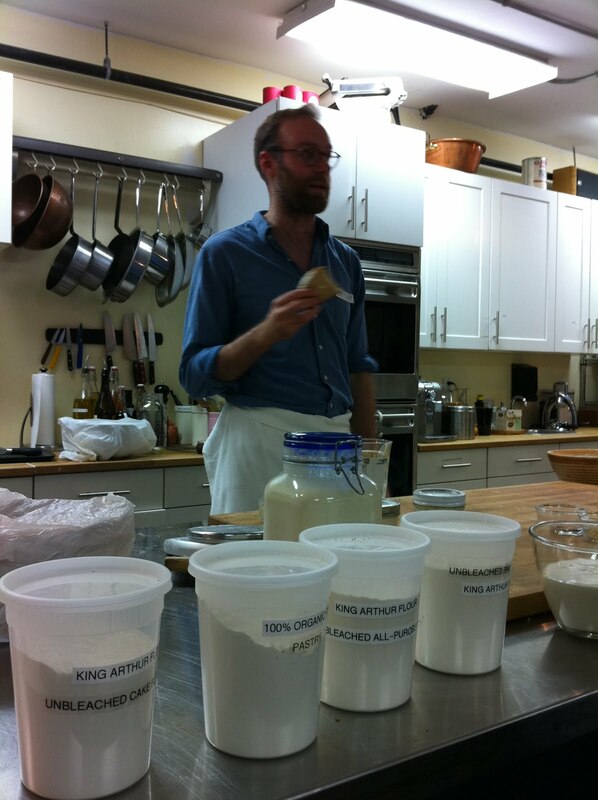 The second part of the class was where you got to make your own cheese. The instructor guided us along in the cheese-making process and we were given worksheets about with the molecular diagrams of milk acidification. 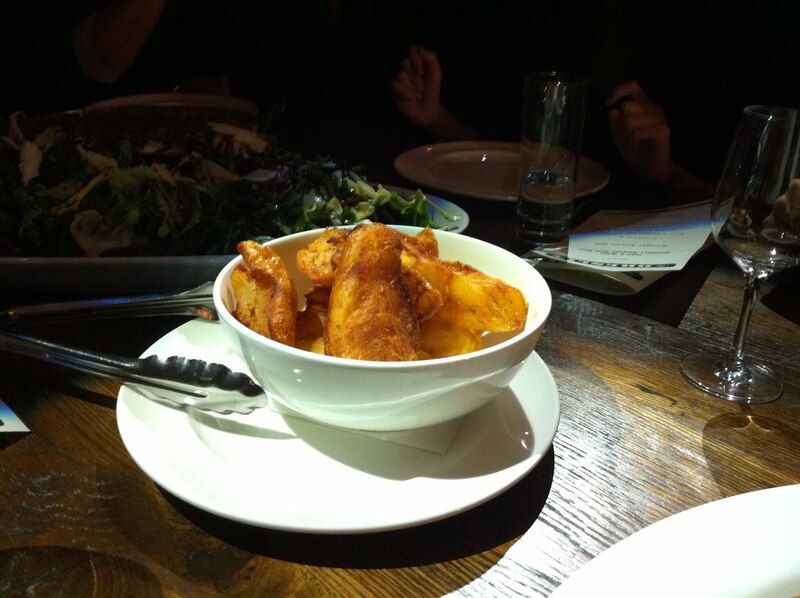 Then we were given large bowls of hot water and cheese curds. You pour warm water over the curds and let it sit. After a few minutes, break apart the largest curd. You want the temperature of the inside to be the same as the outside. From there, begin to press the curds together until you form one solid piece. Then flatten and pull so that you get a long rectangle. Roll it into itself, reform and squeeze out small balls of mozerella! it is not difficult at all but labour intensive (hence explaining the cost of cheese, despite the low cost of the ingredients which are just unpasteurized milk, rennin and citric acid). I'm not sure I would have success replicating this at home but it was fun to be taught and take home a container of your own product. 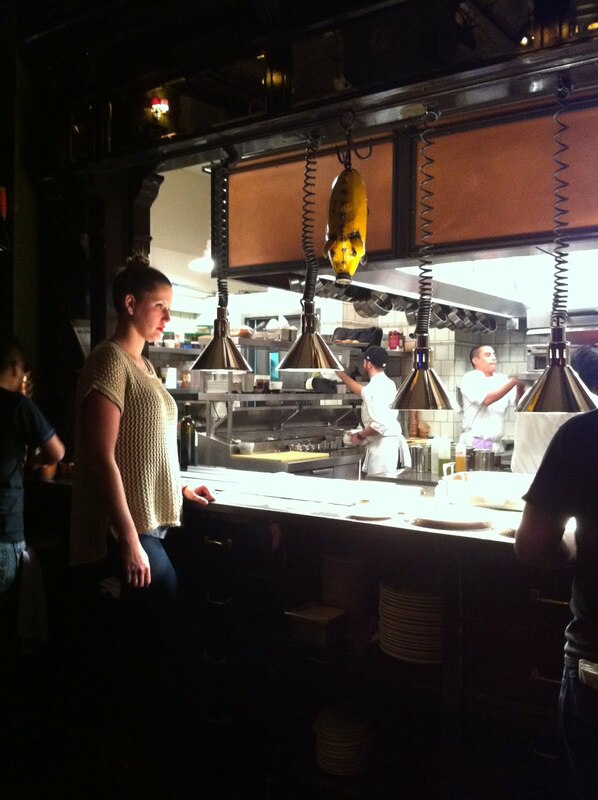 After class, I rushed off to join my friends across town at WD50, a restaurant that I had been curious enough to think about but never curious enough to actually go for. 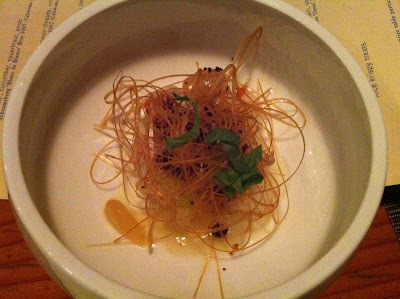 My run-ins with molecular gastronomy at the Fat Duck and other restaurants has been somewhat hit-and-miss. I often feel that the pairings of food are not particularly intuitive, or more importantly, not tasty and I really hate the feeling of powder, foam or "dirt" anywhere on my food. 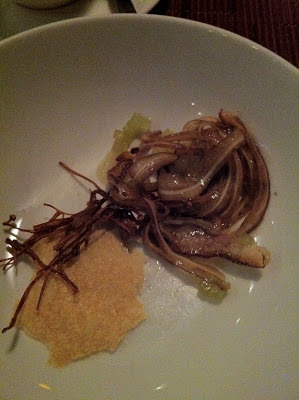 I have to add thought that the NYT ran an article about Wylie Dufresne changing up the entire WD50 shortly after I ate there, and the pictures of the new menu online look far more inspiring. 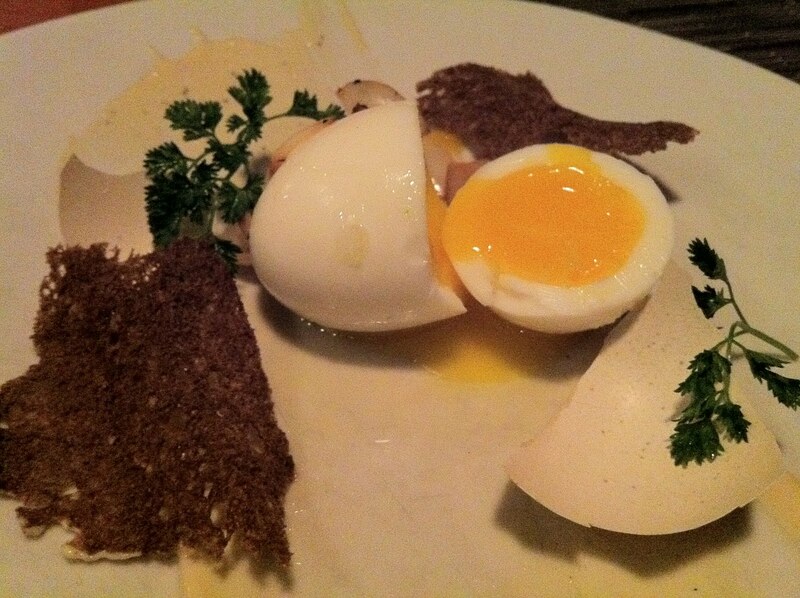 The first dish was the Poached Egg with Edible Shell, which was truly fantastic, in presentation, though not really in taste. Both the egg white and egg yolk weren't really egg at all, so the egg imparted different flavours and was wrapped in a mock shell, that I later found out was made of a think layer of kaolin clay. That's kind of gross, as it reminded me of eating face masks and was somewhat powdery but it was really a visual spectacle to crack open the shell to the egg inside. This was followed by dishes such as pig's ear (not terribly unusual, given it is used in a lot of Taiwanese cooking), lobster roe noodles which had been dried, reconstituted and then shaped into the shards of thin pasta, the lamb on beans and rice (the rice was actually rice-shaped pearl barley or some other carbohydrate that had a really soft smooth taste) and King oyster udon and sweetbreads, the slippery noodles and pan-fried sweetbreads were savory, but surprising hints of pickled ginger gave everything more warmth and spice. The meats were perfectly cooked but as you can see from the pictures, they were really tiny pieces and the most tasty dish was probably the most regular one, which was the udon. 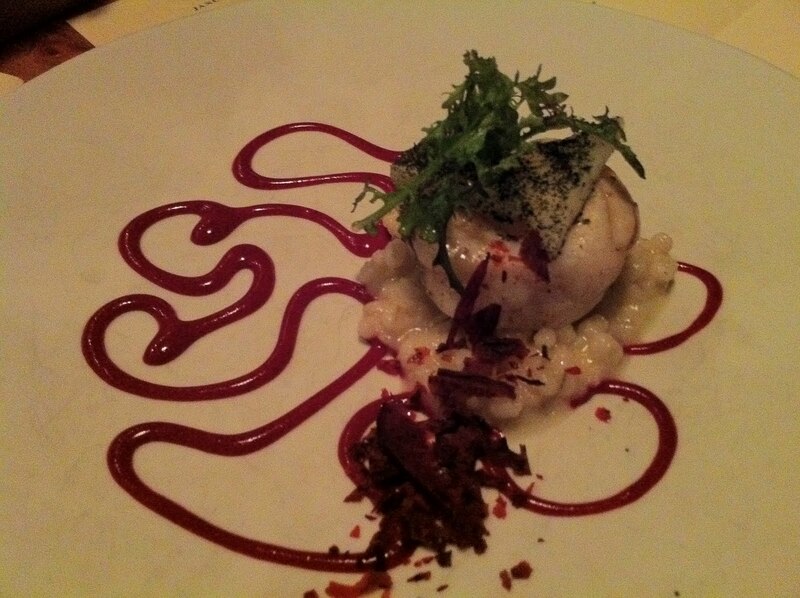 It made me think that we should perhaps have just ordered from the ala carte menu instead of the pricey (but rich) $140 degustation menu. The best part of the meal was probably the three desserts, first the Everything Ice Cream Bagel, this is entirely made of ice cream but does taste exactly like a bagel, down to the yeast of the dough, then second the Yuzu Milk Ice, Hazelnut, Rhubarb, Basil, with it's foamy, spongy texture (this is on his new menu) and the third, which was the Grapefruit curd, campari, hibiscus, sorrel sorbet dish. The thing about the meal was not that it was bad or unfulfilling, but probably that it wasn't umami and it was somewhat repetitive- here is a piece of protein, on a bed of some sort of legume that's been dried, then reconstituted into sand, with a smear of concentrated sauce. 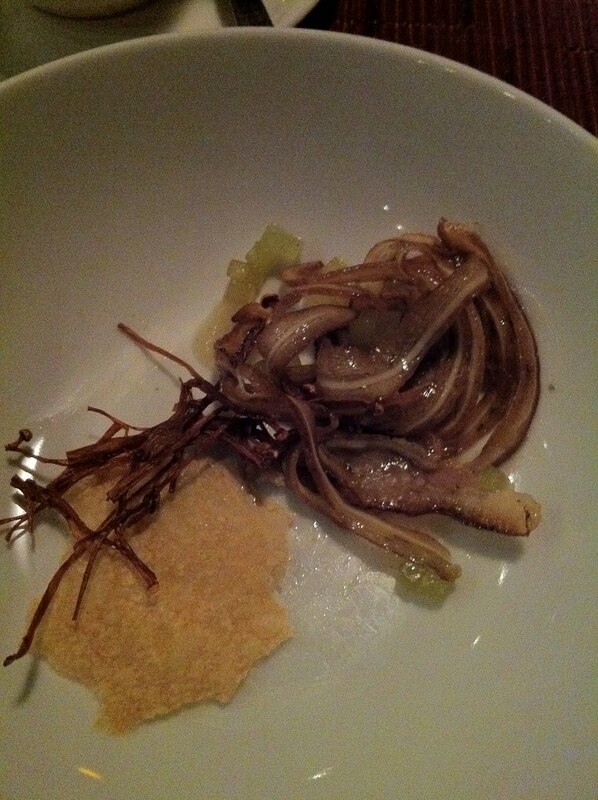 The neighbourhood was definitely unpretentious and so was the restaurant. Dufresne is a leader in the molecular gastronomy movement, and he has won numerous prizes and has frequently been on Top Chef, either as a contestant or a judge. Even so, he still has only one restaurant and has never published a book. The highlight of our trip to his place (and many others, judging by the reviews on Yelp, was being offered the chance to visit the kitchen. He showed us the different prep areas, as sous-chefs and line cooks were whizzing by us, showed us the molecular “pantry” with all its mysterious little white jars, and then he signed autographs, which to be honest, despite the unpretentious setting, all seemed a little desperate and hokey. I spent my last day in NYC back in Brooklyn, attending a sourdough bread making class with Nathan Leamy. I had assumed that we would each be baking some bread during the class but it turns out that it was more of a demo style class where Nathan did most of the bread making as he walked us through the art of sourdough. I was a little disappointed about not being able to get my hands dirty, and I honestly think that unless you do it interactively, it's quite hard to learn how to bake (as versus cook). After his class, I have little idea if I could really shape a sourdough into the shapes that I saw him effortlessly shape and fling into Le Creusets to bake in the oven. I know that I don't have that kind of skill and having the class be hands-on would have gone a long way to actually understanding what I was doing. 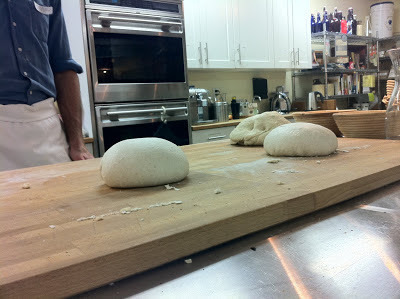 The instructor seemed to know a great deal about breads from all kinds of different parts of the world and he pointed out tips and addressed possible problem areas, however, without the actual hands-on again, the information doesn't tend to stick. Nathan shared some of his sourdough starter with us to take home but being that I was leaving back to Singapore, I couldn't transport it successfully and have yet to bake a real loaf of bread!